• Cigars developed to kill, confuse or humiliate Fidel Castro—not surprisingly, one would have made his beard fall out. • The beloved skyhook—yes, the thing that yanks people from the ground up into airplanes. Learn of its origins, early animal test runs and its one successful on-record mission. 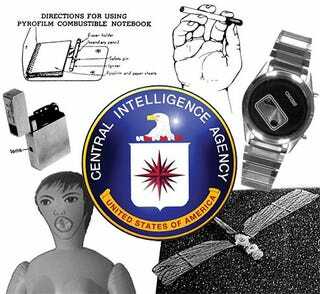 • The Soviet's most amazing spy gadget, dubbed "The Thing" by befuddled CIA agents who didn't know how on earth it worked. It was built by Theremin, inventor of that wacky musical thingy, himself a part-time Soviet agent and researcher. • Spies, spying and spy talk. Yes, the book may be focused on hardware, but man it's full of crazy stories about spies. The most interesting tales are about the Russians who were leaking info to the US, often upon pain of death. Stories of American traitors are pretty familiar, but you rarely get to hear about what went on over on the other side of the Curtain.